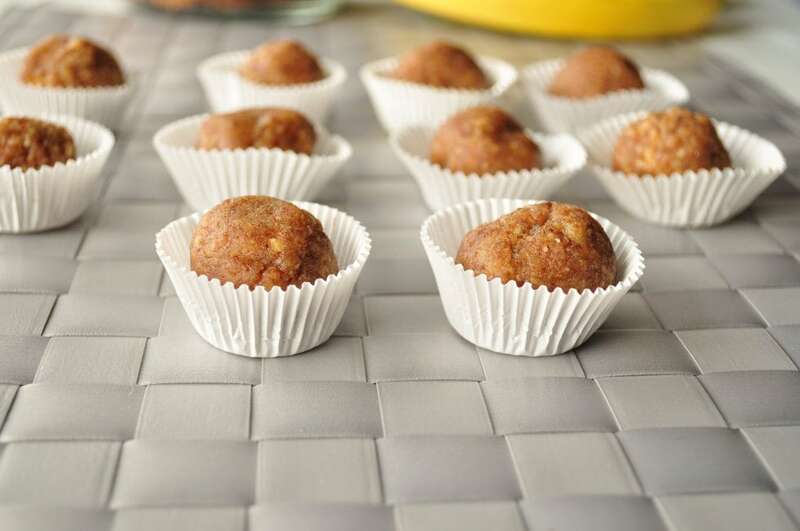 Copycat Banana Bread Larabar Bites. I just love making larabars! So easy and they take minutes to make. My favorite is still my coconut cream, but I think these banana bread larabar bites are my daughter Meadow’s favorite. This is also a reader fave! It’s easy to see why, they are delicious! I think my husband’s favorite is the Chocolate Brownie. This banana bread recipe took me two tries to get right. I wanted to change it up, so this time I rolled them into bite sized balls instead of bars. I got about 20-25 bites out of this batch. In the food processor, grind the almonds into a fine consistency. Next at the banana and the dates and pulse until a dough starts to form. You may have to stop every couple of pulses to scrape down the sides to insure that everything gets well combined. Roll dough into little balls and place on a baking sheet lined with parchment paper. Keep them stored in the fridge and they should last a couple of weeks. Mine have never lasted more than a handful of days though! I meant dough* not a douce. Tastes like moist banana bread! My husband and I can't stop eating the batch I made! I wonder how these would be if you soaked the almonds first, and then put the balls in the dehydrator. Do you use the dehydrator for many recipes? Seems like and easy way to make them shelf-stable and make the bananas a little chewier. I may give it a shot this weekend! Thanks! I normally just use the dehydrator for fruit leathers and chips. I would love to know how this recipe works out for you in the dehydrator. Hi Melissa - I have cashew meal, how much do you think I should use? Yum! Just made these and had to get them put away in the fridge quick before I ate the whole batch! I subbed walnuts for almonds because that's what I had. I also added ground flax and cinnamon as thoseare two of the things my cancer ssupport dietitian wants me to increase, they went perfect with these! Thanks for another home run! They've been setting in my fridge for about 12 hours and I still have goo balls. Yummy but goo. I'm NEW at soaking my nuts (phytic acid be gone). Maybe i did not hydrate them long enough. I think this is where i went wrong :( Can anyone think of a way to salvage my mistake? Completely my fault! Must be the water they absorbed & my lack of dehydrating them. Its still delicious. I'll call this batch pudding & try again. THANK YOU for your fantastic recipes! Hi Melissa, I have raw almonds, but wondering if almond meal would work too? If so, do you know how much to use? Thank you, I have bananas to use before I leave town for a few days. It might? Maybe 1/2 cup? Let me know if that works! I'm wondering about the banana. Should it be a slightly overripe banana, like one I'd still eat, or a very overripe banana that you wouldn't eat, and would only use for baking? I prefer a slightly ripe banana for these. Love these! So often I forget how much I love the banana/walnut combo. I followed your ratio of banana/nuts/dates and these turned out delicious. Used almonds and walnuts and added a dash of cinnamon, vanilla and salt. Then rolled them in some finely shredded unsweetened coconut flakes. Love keeping these in the freezer for a yummy sweet treat! Thank you! Hi Melissa. Love your blog!! I tried these for the first time this morning. I used walnuts and a bit of cinnamon and nutmeg. To reduce to stickiness I added a couple tablespoons of coconut flour to the dough. I rolled them in hemp seeds because I have a lot of them and want to use them up while they're fresh. They taste great!! Can't wait to see if my grandson will love them too! Thanks for making my efforts to live a healthier life so much more delicious!! You are so welcome Barbara! Glad you enjoyed the recipe. Love your blog! These bites however, leave something to be desired. I wanted them to be good, so much so that I planned for days to make them until Sunday came and it was time. But they were so "meh" that I couldn't bring myself to share them with the Larabar fans at work. I think it's missing a hint of nutmeg or allspice or something. It's just not quite right yet but that doesn't mean it can't be! Thank you, thank you, thank you!!! I have been looking for months for these to be back into the stores and internet. It's my daughters favorite. Now we have an even healthier tastier larabar. And no rancid, pasteurized nut bar. Looking forward to trying out the other recipes. Fantastic - after we put them in the freezer for a bit, we dipped them in melted gluten, dairy, soy free dark chocolate chips. What a wonderful little dessert bite!